Biking was one of the best decisions we made on this trip. The park entrance was only ten minutes from our beach, so we grabbed a map and went on our merry way. The ride to the park and within it was absolutely breathtaking: curvaceous hillsides, ocean vistas and green hues as far as the eye could see. Before I go on, some advice: WEAR TRAINERS OR HIKING BOOTS. I, stupidly, wore my flip-flops thinking that we’d find only short, easy walks, and that we could bike most of the way. Unfortunately for my feet (and Nikki’s sanity), I couldn’t be more wrong. At the trailhead for Phraya Nakhon Cave was a parking lot surrounded by restaurants and shops. We chained up our bikes and started off on what became an hour-long hike up a very steep hillside, along which I flipped and flopped into some nice swollen blisters. I knew I could only blame myself, but I still wanted some comforting. Nik was very accommodating until I even began to annoy myself with the “poor me” whining. It was time to woman up, at which point I really noticed the scenery. We met viewpoint after viewpoint of tropical vistas, and explored caves, one of which must have been Phraya Nakhon, although none of them looked like the online photos. 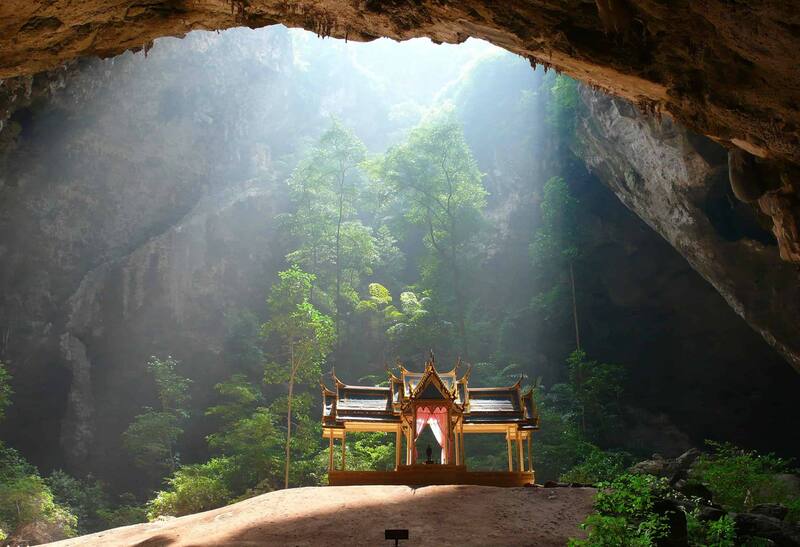 And then we reached the opening to Phraya Nakhon Cave. All remaining thoughts of my battered feet were immediately replaced with absolute awe. It is one of the most stunning sights I’ve ever seen. Cascading limestone walls surrounded us. Strangely, as we went deeper down, there were more and more trees and vegetation. This is due to an opening in the roof where shafts of sunrays stream into the dark cavern in golden bands. The sunrays touch a golden shrine dedicated to King Chulalongkorn, which glows in a halo of soft light. “Now you see it, do you believe it?” I asked Nik. It was magical, and experiences like this are the reason we love impromptu travel. Sunset hues lit our ride through the valley back to Phu Noi beach, which was simply the kind of romance you can’t plan. After dinner, we decided a bottle of wine on the beach would cap the evening. Pranburi is a sleepy little town, so we had the beach and night sky to ourselves. We grabbed our bottle of red, strolled to the deserted sands and cuddled up on our sarongs, sipping wine under the stars. Nikki and I will definitely be returning here when we have more time. There’s so much more to Khao Sam Roi Yot that we want to explore.